Once your deposit has confirmed, you’ll now have access to your funds and you can begin purchasing/trading. To purchase CPChain (CPC) on Kucoin, you’ll want to move over to the “Markets” tab and click on the appropriate pairing. 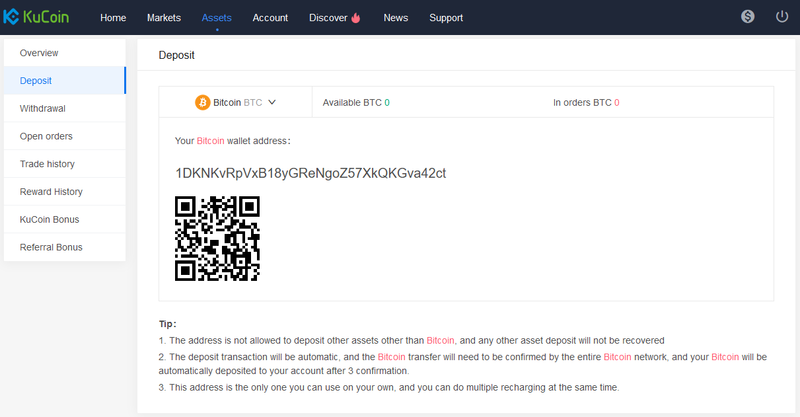 We’re using BTC to make a purchase, so click “BTC”. To locate CPChain (CPC), you’ll need to type the coins “ticker” (CPC) into the search box highlighted in the picture we have provided. Make sure you have selected the correct pairing, we’ve highlighted this too. Click on “CPC/BTC” to proceed. Once you’ve located CPChain (CPC), you’ll be presented with a Price Chart (Left) and some Order Books (Right). For now, we’re going to create our own Limit Order (Bottom Right). The “Price” field will be automatically filled with the most recent price CPChain (CPC) was sold for but this can be changed to your desired price. The “Amount” field is the amount of CPC you wish to purchase. The “Volume” field is the total price in BTC that you will pay for the whole amount. When you’re happy, click “Buy”. Your order will be filled when a Seller sells their CPC for the price you submitted. Locate CPChain (CPC) by using the drop-down box highlighted. Enter your wallet address and the amount of CPC you’d like to withdraw, taking into account the fees/minimums shown. make sure the withdraw address you have entered is yours and is correct. Withdrawals from Exchanges can take anywhere from 1-30 minutes depending on network usage. Once you’ve confirmed your withdrawal using Etherscan.io or Ethplorer.io and the CPC is safe inside your wallet, you’re all done.